The development of Trinity and its patented ability to horizontally steer a large bandwidth of frequencies required a completely new solution; create a waveguide that would accurately control midrange and high frequencies with smooth, consistent, and uncoloured response across the horizontal plane. 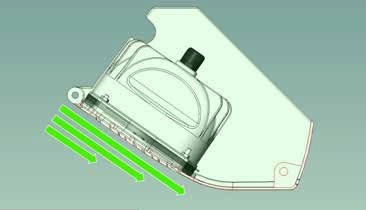 The waveguide needed to have variable control from 50 to 120 degrees to allow the system to have remotely-controlled adjustable directivity. 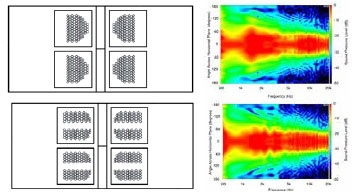 Developing a variable waveguide with sufficient low frequency control and a consistent polar response proved challenging. To solve the problem, we applied a basic scientific method; define the problem, investigate all current approaches, propose a new solution, test the solution candidates through multiple iterations, and repeat the process until a solution was perfected. It was required to investigate and refine each part of the system to understand the complex interactions and dependencies, as each design decision relates to each other and the system as a whole. 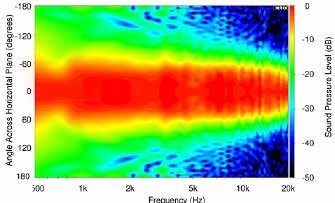 First consider the limitations and design constraints of the low frequency and midrange frequency sections, followed by the high frequency section. In order to obtain sufficient directionality in the low frequency passband, the drivers should be symmetrically spaced on the outside of the cabinet with the emitting surfaces at a specific distance apart. This creates directionality through off-axis cancellation. To achieve pattern control to the lowest frequency possible, the emitting surfaces should be as far apart as is practically possible, however this distance also conversely limits the useful upper frequency cut-off. 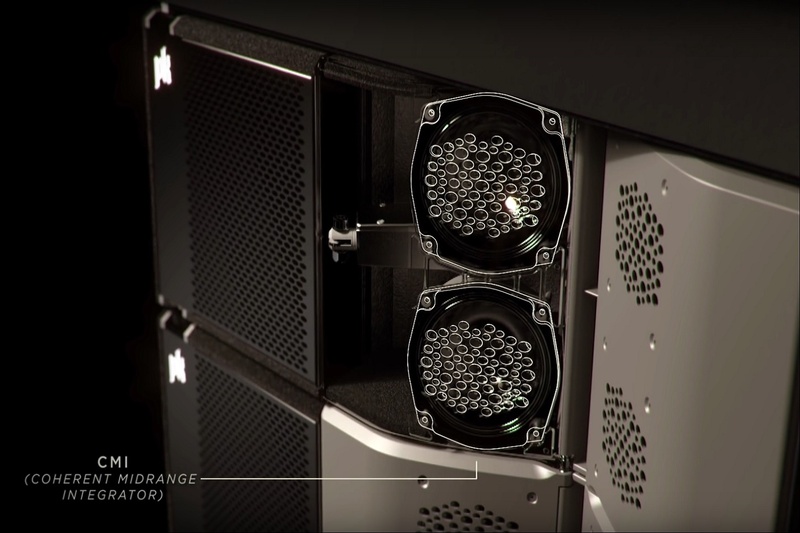 Considering the width of a typical large format line array which is constrained by reasonable truck-pack dimensions, the usable upper crossover point of the low frequency section is limited to 250 Hz. Higher crossover points will create inconsistent lobing and narrowing of the polar response. One solution used in the industry is Band-limiting one of the low frequency drivers to allow the other driver to play higher, however this results in horizontal asymmetric lobing around the crossover frequency. Take for instance, a 15” line array which is roughly 43cm (17”) in height in order to adhere correctly to line-array theory, with vertical element spacing within one half wavelength of the lowest frequency. In this case, drivers should not be used with a crossover higher than 250 Hz, as even when utilizing a 24db/octave crossover, there is still significant radiated energy one half-octave above the crossover point, and the half wavelength of 400 Hz is 42.9cm (16.92”). Effective driver spacing is the primary reason for specifying 12” drivers and limiting the highest crossover point of the low frequency section to 250 Hz. A properly-designed 12” horn not only reduces the required cabinet height (and therefore the vertical center-to-center spacing) to a maximum of 34cm (14”), but performs at least 3db more efficiently than a front-loaded 15” design. Using horn-loaded 12” drivers significantly improves transient response due to a highly-loaded lower moving mass, and decreased cone travel. Horn loading also places the narrower radiating surface of the low frequency exit at the correct distance apart horizontally to achieve smooth directivity from 90 to 250 Hz. The next challenge is since there is no single driver that will effectively play 250 Hz to 20 kHz for this high output application, the remaining frequency range must be separated into at least two sections incorporating high and midrange drivers. Since adjustable directivity is required in this passband, the design must have the midrange transducers symmetrically placed on either side of the high frequency exit to avoid asymmetric horizontal lobing, and to avoid changes in distance between the midrange and the high frequency sections when the horizontal directivity is being changed. 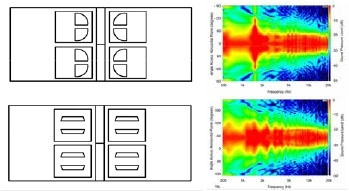 If the midrange transducers were located behind or adjacent the high frequency section, the midrange response would change as the high frequency waveguide adjusts. The centre-to-centre distance of horizontally spaced midrange elements should be less than one half wavelength of the highest frequency emitted to avoid horizontal lobbing. Based on 6” midrange drivers, with a 25.4mm (1”) wide exit for the high frequency driver, the centre-to-centre distance would be approximately 23.38cm (9.2”). This distance equates to the half wavelength of 725 Hz. Therefore, the crossover point for the midrange section is set to be 700hz. The maximum centre-to-centre distance of the midrange is 23.38cm, (9.20”) while the waveguide is fully open at 120 degrees. When the waveguide closes to 50 degrees, the distance between the midrange drivers is reduced, and because the change in distance 5.12cm, (2.01”) is small in comparison to the highest wavelength being emitted, the effect on directivity is minimal and the drivers are phase-coherent throughout the motion of the waveguide. Additionally, in order for the high frequency waveguide to have 120-degree horizontal pattern control down to 700 Hz, the waveguide exit should be at least 30cm (11.8”) wide. 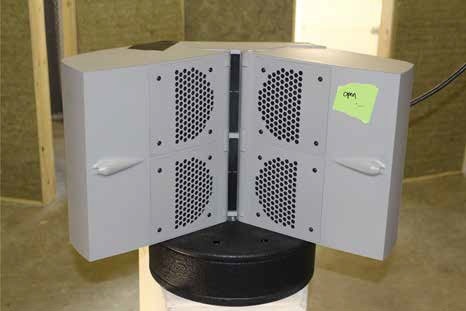 The lower the crossover point, the larger the waveguide must be to have consistent directivity through its entire operating range. 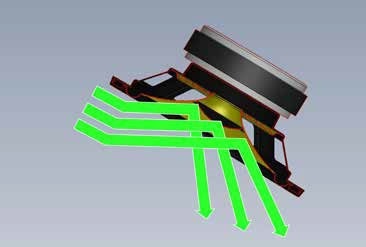 This reinforces the decision that the midrange must be placed on the moving surface of the high frequency waveguide; otherwise, the drivers or their exit aperture will be too far apart, or the waveguide will be too small to have sufficient pattern control. Placing the midrange exit on the surface of the waveguide introduces a new set of constraints, since surface or edge inconsistency along the waveguide path can cause diffraction or reflections for the high frequency. Placing large exit apertures or protruding surfaces causes measurable inconsistencies in the polar frequency response. Edges cause diffraction, large regular shapes can cause cancellations and cavities can create resonance, reflections, and incoherence. A need arises to find a way to integrate the midrange passband and maintain sufficient midrange exit aperture area so that sound pressure can exit the driver without creating too high compression on the cone, all the while ensuring that any cavity in front of the cone is minimized. Secondly, distortion is proportional to the length of the exit path, and therefore the length of the exit must be kept to a minimum. 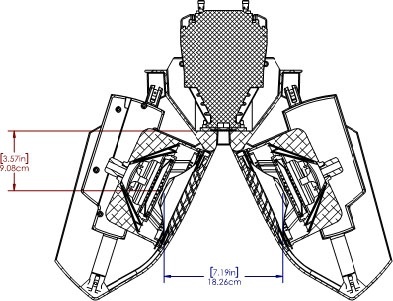 Given these specifications, a new type of exit aperture for the midrange needed to be developed that integrated with complete acoustic transparency, the various pass-bands into the waveguide. The advantage of 3D-printing is that an idea can be turned into a design, printed, and then tested within 24 hours. This is exponentially faster than creating and resolving a complex FEA simulation. FEA simulations must often be simplified in the interest of time, and it can be very difficult to accurately test complex surfaces in a timely manner. On the other hand, there is no substitute for measuring and listening to a real prototype, as very often two prototypes can have nearly identically measurements but sound dramatically different. The process began by testing the current methods applied in the industry to understand the pros and cons of each one. This provided clear confirmation that large regular shapes, cavities and edges significantly impacted directivity, each having its own on- and off-axis anomalies. Over the course of development, more than 62 different design iterations were built, measured, and tested. (Major competing manufacturer designs that were tested have been purposely left out of the examples below as it is not the intention to point out what is wrong with other industry designs.) These commonly used designs were simply studied to determine what can be learned from them. The following table shows a small sample of tests that were performed with the corresponding results displayed in polar isobars. Any aperture opening placed on or near the waveguide will have some effect. However, to achieve a variable, symmetric waveguide, the midrange drivers must exit onto the waveguide through some means. The challenge is to create an exit for the midrange acoustic energy with minimal impact on coherency and maximum efficiency for the midrange driver. 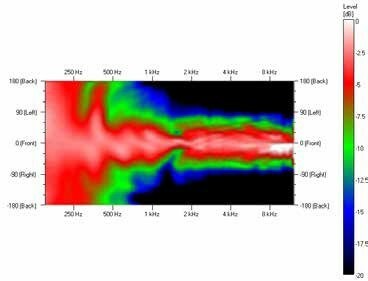 By systematically investigating and then improving each iteration, we developed a design capable of consistent polar coverage throughout the 50 to 120 degree operating range, and the coherent midrange integrator waveguide was created. Openings which are large, consistent or have parallel edges, are the least desirable because they create significant reflections. Any cancellation will be proportional to the size of the opening; therefore, the openings are small and any possible inconsistencies are above 16 kHz (one half wavelength or 1.07cm). Furthermore, having multiple apertures of the same size can create inconsistencies proportional to the size of that aperture. Using multiple, differently sized apertures, arranged in a non-regular pattern dramatically reduces any inconsistency introduced by the midrange exit onto the waveguide. 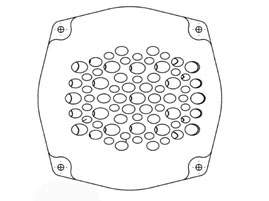 The pattern and hole sizes are shown in Figure 4 of the phase plug drawing below. When sound travels across an edge or corner it diffracts around that edge. The further around the radius of the edge the less sound energy is transmitted. In the case of an opening with an exit perpendicular to the surface of the wave guide, significant sound energy will diffract around the edge and travel down the path until it reaches the midrange cone, where it will be reflected back out of the opening, out of phase with the original wave creating incoherency and inconsistency in the polar directivity. On the CMI waveguide, the exit path length is angled away from the direction of sound travel. Energy from the high frequency driver diffracts slightly around the edge and is then directed back along the same path. Because the difference in distance traveled between the original path and the modified path is insignificant compared to the wavelength, the effect of the aperture on the high frequency energy is minimized and coherency is maintained. In addition, because the length of each small tube is insignificant compared to the frequencies emitted by the midrange transducer there is no distortion introduced due to tube resonance or reflections. 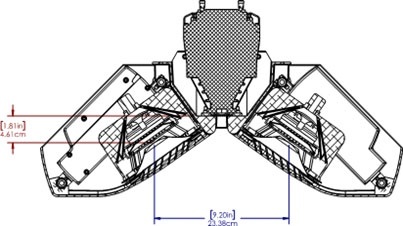 Any large cavity between the midrange transducer and the waveguide will introduce an area where possible reflections, resonance and refractions can accumulate and negatively impact sound quality. 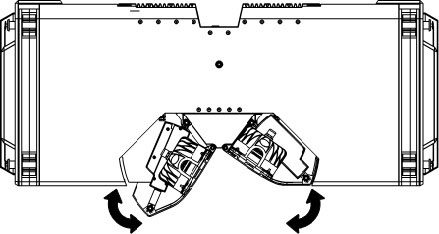 The short, angled exit apertures were incorporated into the phase plug design that contours the front of the midrange cone and transitions the exit to the waveguide. The result is a phase plug that reduces volume in front of the cone, thereby removing unwanted resonance and refraction, all while increasing the efficiency of the midrange transducer and drastically reducing any high frequency passband interaction. In the figure below, it is clear the resulting horizontal coverage from the CMI waveguide is impressively consistent throughout the entire frequency range. Figure 14 - CMI Prototype waveguide polar isobar 1/12 oct.
By applying a systematic investigation to study the effects of multiple shapes and how each effects sound quality, we achieved a variable symmetric waveguide with sufficient low frequency pattern control, smooth polar coverage across the entire frequency range, and increased output of the midrange transducers. next post: PK SOUND'S TRINITY SITS TOP OF Its CLASS AT USC'S 5TH ANNUAL BASS ACADEMY.